Hello! I'm back from my two week residency at the Vermont Studio Center and excited to tell you all about it. (Don't know what VSC is? Check out this post for more info.) 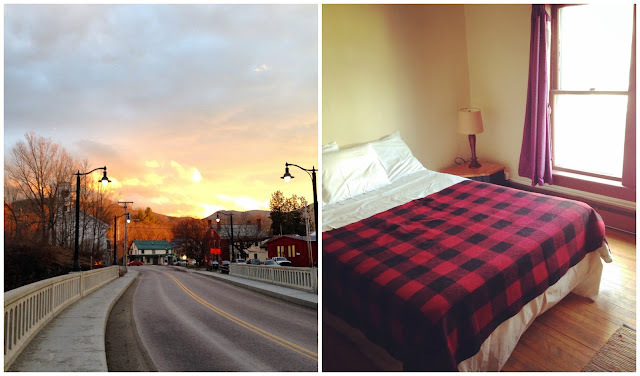 Before I left for Vermont, I read the website and handbook to prepare myself, but I had a hard time finding any thorough, first-person accounts of what, exactly, people did during their residency. This post is an attempt to remedy that situation, and to share the peaceful and productive time I spent in a truly amazing place. It's also really long, so maybe grab a cup of coffee and find a comfortable seat before we dive in. VSC after a few days of rain and snow. I arrived at VSC on Saturday, April 9th. The way the residencies are set up is that most people stay for a full month. The folks staying for two weeks are split between groups A and B. The A group is there for the first two weeks of the month, and the B group (or the B Team, as we called ourselves) stay for the last two weeks. There were only nine of us who arrived on the 9th for the second half of the month. This was perhaps the only negative thing about my experience, and it wasn't even that bad; it was akin to moving to a new town your senior year of high school and trying to break into the cool crowd. Luckily, everyone on the B Team was super interesting, nice, and fun, and we had a great time bonding over meals in the dining hall and beers at the bar. If I ever go back to VSC (and I hope one day I will) I will request to come for the first two weeks of the month, because I think that will yield a very different experience. Not necessarily better, just different. Resident artwork as seen during Open Studio Night. 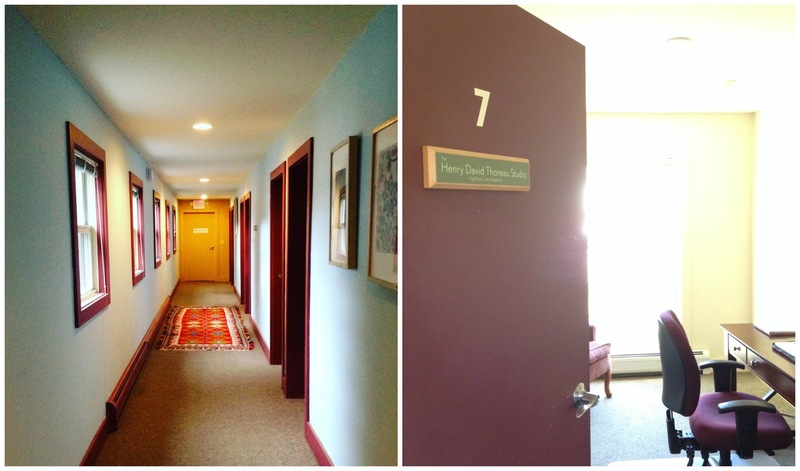 VSC offers residencies to both writers and visual artists. One thing I didn't realize until I got there is that the artists outnumber the writers by 35 to 15. 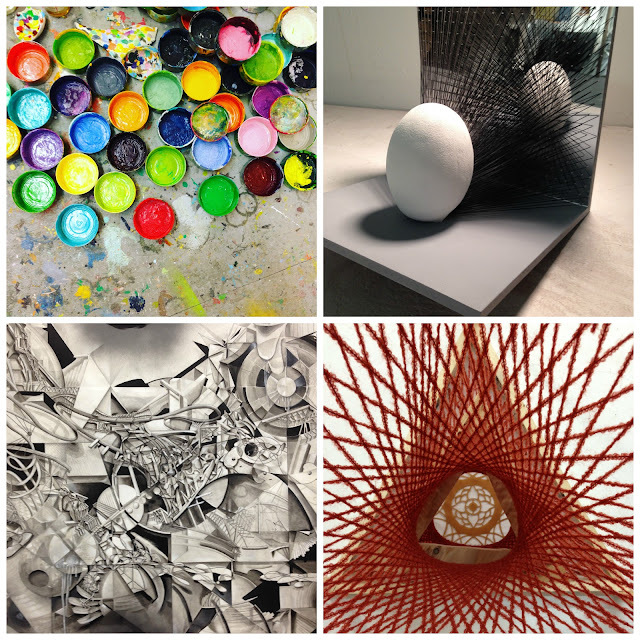 It was refreshing to be around so many artists, especially since they were doing such a variety of work. It was also interesting to compare artists and writers - our work habits and processes are so different, and I'm still working through some ideas based on what I saw, heard, and learned. While the days were very quiet and focused on work, there was usually something going on each evening at 8PM. Sometimes it was resident slides, during which artists shared photos and gave presentations of their work, and sometimes it was a reading by the writers. There were also guest artists and writers there, and they gave presentations/readings in addition to meeting with residents one on one. Antonya Nelson, the wonderful short story writer, was visiting VSC while I was there, and I was thrilled to attend her craft talk and get her feedback on a short story I've been struggling with for almost two years now. A beautiful little yoga studio. I came here almost every day. I think people who don't consider themselves artists or writers assume creative work is this magical, inexplicable thing. That we're all drifting along, waiting for inspiration to strike, communing with our muses late into the night. In reality - at least for me - creativity and inspiration usually strike when I'm engaged in a routine. Luckily, VSC made it easy to establish a routine almost immediately. Our days were structured around work and food. Breakfast was from 7:30 to 9AM, lunch was 12 to 12:30PM, and dinner was 6 to 6:30PM. This meant all 50 or so residents stopped whatever they were doing and went to the dining hall at the appointed times to eat and take a break from their work. This also meant that every day, from about 8AM until 12PM and then from 1PM until 4PM, I worked. There wasn't much else to do, which was actually kind of wonderful. The dining hall had fresh coffee all day, so sometimes I'd walk over for a refill, but otherwise I was writing, revising, and researching in my small studio. This made it so easy to focus, and I got way more done than I anticipated, which was really gratifying. L: the walk to town. R: my little room. All meals were served in the Red Mill, which is the biggest communal building at VSC. It was very comfortable, very cozy, and very beautiful - a great place to talk, eat, and spend time. As you probably know, I love food. I also have some weird dietary restrictions - I don't eat meat, and I avoid dairy as much as possible. While the food at VSC was overall very good - fresh, healthy, and local - it wasn't ideal for a semi-vegan. Most nights there was a vegetarian option alongside a meat dish, but sometimes it was lasagna, with cheese. There was also a big salad bar, warm bread, and a killer cheese plate every day at lunch. I ended up eating quite a bit of cheese (for me) and it didn't seem to affect me too much, which was nice. I know some other people who were more sensitive to me, either to dairy or to gluten, had a harder time. Overall, though, I ate well and appreciated the fact that we had dessert every night. Also many people brought wine or beer to dinner, and if you go to VSC I highly recommend buying a box o' wine and keeping it in your studio. Cost effective and convenient. Residents at VSC stay in various houses along the same road. 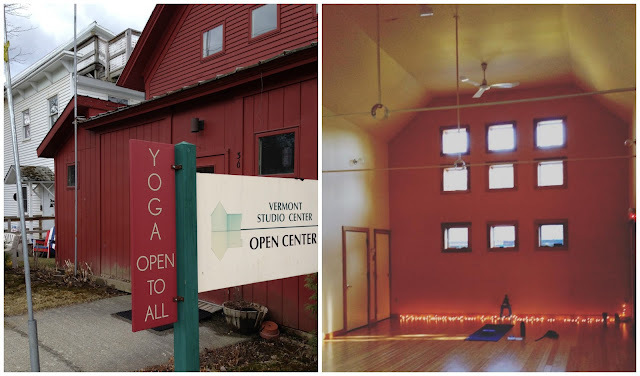 From what I saw and experienced, it seems like the Vermont Studio Center basically bought up a bunch of houses and buildings, then converted them into a sort of commune/paradise for artists. I stayed in Corner House, which a yellow house on a corner. The room was small, comfortable, humble, and even though I shared it with five other people, I almost never saw them. Because we all eat at the dining hall and work in our studios, the houses are only used for sleeping. This was fine with me, because my studio was the best place at VSC, and my favorite place in which to spend time. Maverick: Where the magic happens. At the Vermont Studio Center, the writing studios are all housed in Maverick. This a long, narrow, two story building had eight studios on each floor. They each hold a desk and rolling chair, a bookshelf and a bulletin board, and a reading chair. 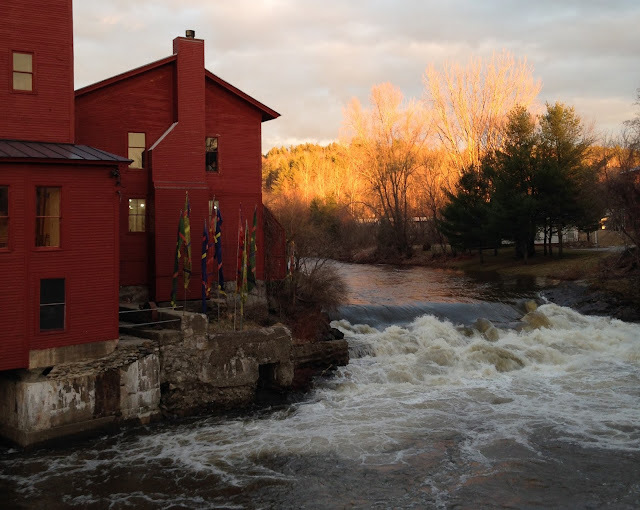 Each one also has a large window overlooking the Gihon River, which cuts through the center of the Vermont Studio Center. While I have my own little office at home where I write, my studio in Maverick felt different, almost magical. Maybe it was the fact that it had been used by countless writers, maybe it was the river outside my open window, maybe it was the freedom and privacy it offered, maybe it was just the "room of one's own" vibe. Whatever it was, it made me happy, glad, and grateful to spend time holed up in it, whether I was writing, reading, or staring out the window. I really enjoyed my time at VSC. Bringing a rough draft of a big project and staying for two weeks was an ideal situation at this point in my writing life. I met great people, stayed in a remote and beautiful town, ate well, and spent hours every day completely immersed in my craft. If you're a writer or artist, I definitely recommend applying for a residency and/or a fellowship. 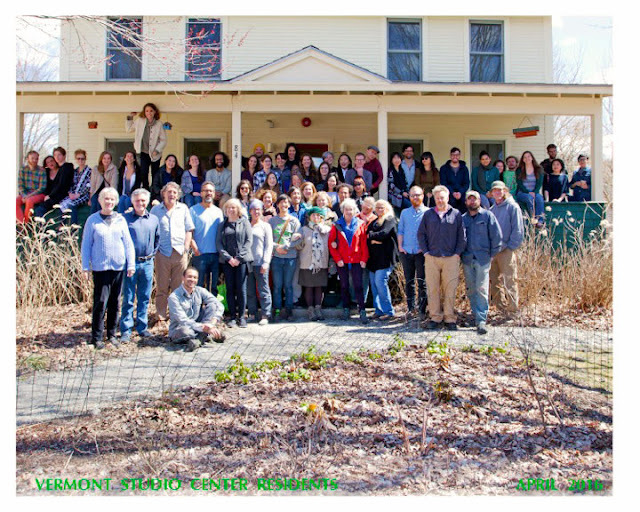 Thanks to the Vermont Studio for what was perhaps the most peaceful and productive two weeks of my life. Until we meet again!